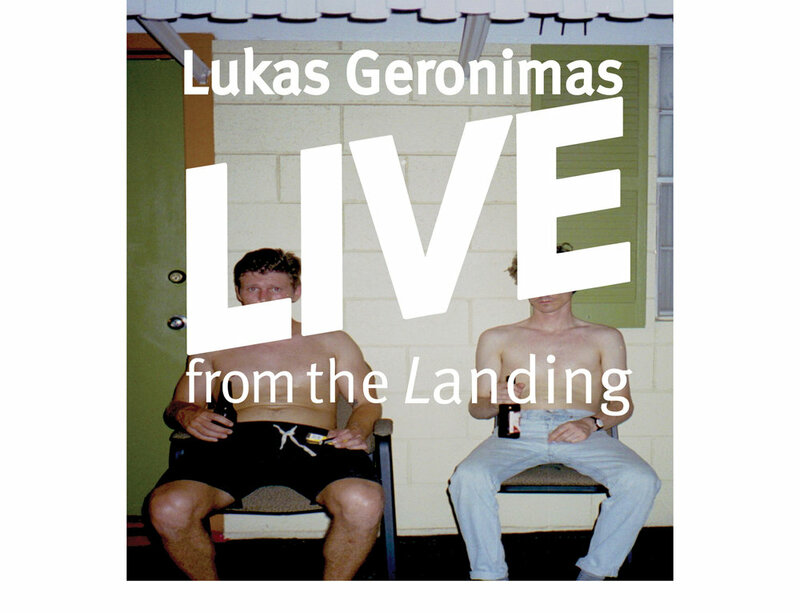 The Landing is pleased to announce a solo exhibition by Lukas Geronimas, Lukas Geronimas LIVE from the Landing. The artist will be presenting a new group of works made since his move to Los Angeles in 2015, as well as a survey of newly refashioned and recontextualized works made within the last six years, which will be hung six inches apart across an eighty-foot span on the gallery’s east wall. This is the artist’s first solo presentation in Los Angeles and his first exhibition with the Landing. Geronimas has had solo exhibitions at and David Petersen in Minneapolis, Jack Chiles and Asian Song Society in New York. Select group exhibitions include those at 247365, Bodega, KANSAS, and Andrea Rosen Gallery 2 in New York, Cooper Cole in Toronto, and Michael Kohn Gallery in Los Angeles. Originally conceived of during the installation phase of Two and a Half Men or Colin Engel, a group show featuring Ryan Foerster, Shawn Kuruneru, Jesse Harris and me at Cooper Cole Gallery in Toronto, this concept allowed each artist to take turns placing work on the wall with only six inches separating each piece. After we’d filled one length of gallery wall, the effort was deemed a failure; the tactic was revised and pieces were moved to form smaller groups of tightly-hung work with more conventional spacing between groupings. Eventually this tactic was discarded completely in favor of a more recognizably tasteful hang, although one of these groupings inspired three works to be hung very close together in the back room of the gallery. The reasons for why this tactic failed: the direct democratic promotion of variety content directly defying standard measures of taste, the inability on the part of all four artists to unanimously agree on the synergistic efficacy of the tactic, and the lack of confidence on the part of the gallerist that any of the works hung together in this way would sell. These were all barriers that have been removed this time around, so that the six-inch hang can be imposed upon the longest span of gallery wall at the Landing (80’ approximately), featuring one artist’s work. Early during the process of building out my studio in Mid City, I found a need for quantities of dimensional lumber. The Reuse People of America in Glendale had pallets of primarily old growth reclaimed Douglas Fir stock available, and I was able to purchase two pallets of this stock for $.20/ft, which is cheap for any dimensional lumber, and very cheap for old growth. I had overestimated the amount of lumber I’d need to frame out the studio, and was left with a vast surplus of Douglas Fir. I have used this surplus to make: a new run of eight Custom Stools (my first run milling everything from standard stock, dowels included), stretcher bars for a friend and me for a recent large-scale commission, my couch, most of the tables and storage units in the studio, push sticks for my table saw and jointer, a shark’s tooth carving, the wooden components of two “Custom Beam” sculptures and the “Large Custom Table” in this show, fire wood for my studio oil drum fire, and most recently the wooden component of my sculpture “Ying Yang Shelf” and “Custom Hangers.” I still have lumber left. My friend David Horvitz recently moved with his family to L.A., and asked me if I had one of my stools around for him to use. I told him the new ones would cost him money, as they are now considered valuable. I did however have two older stools, partly painted black and white, one of which I offered to give to him for free, as it had seen some use. So he took that one, of course. I first made a “Custom Stool” for my thesis show at Bard College, and then made more once the thesis show was over and it came time to dismantle some of the large-scale work in the show. (I used the wood from the large-scale work to make eight stools, and I had made seven for the thesis show.) I offered them to faculty and students for $50, or for an art trade. I don’t think I’ll have the chance to give away many more stools, as I’ve only got one old stool left in inventory. But I anticipate I’ll be selling some more new stools, which is a welcome change. The new stools are sturdier, and prettier, and will probably be used less often. Gerard O’Brien is a very big fan of the band New Order, and they are playing the same night this show opens at the Landing. As an option for ephemera coinciding with the show, Gerard proposed that I design a New Order show poster that could be printed and distributed alongside the exhibition. Luckily for me, I had already designed the promotional material for the show’s print ad, and the title of the show is LIVE from the Landing, which made it very easy to adopt the graphic content and titling already in play. My ambiguity towards the music of New Order is the serendipitous thing here; I’ve been able to use the promotional support of content that I care very much about (my show) to instead promotionally support content that I don’t care so much about (the New Order show). Promotionally nonspecific ‘LIVE’ t-shirts, available at the gallery but not at the New Order show, are the byproduct of the common ground shared by both items, and arguably the more genuine ephemera accompanying this exhibition. Inspiration for this sort of duplication most likely came from my interaction with a dozen or so Garbage Pail Kids cards while in New York recently, which I purchased from The Thing, a thrift store in Greenpoint. Along with the cards, I bought a button that says ‘HAVE A NICE DAY f*ck someone’ - all for $5! Out of the cards available for purchase, there were two pairs of cards with the same illustration but different pun names: ‘Soapie Opie’ and ‘Rubbin’ Robyn’ for a kid made of a blue sponge being used to clean a tile wall, and ‘Reggie Veggie’ and ‘Grate Scott’ for a kid made of potato being passed along a metal hand grater. I bought both similar pairs instead of choosing favorites among them. - Lukas Geronimas, 2016.